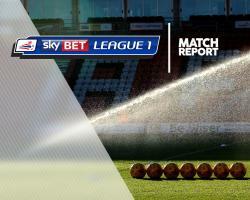 Bradford took another step towards the Sky Bet League One play-offs with a nervy 1-0 win over Oxford. Nicky Law scored the winner in the 59th minute on his first start since February following a lay-off with a knee injury. The visitors failed to deal with a left-wing cross from Mark Marshall and Law poked the ball into the net when Charlie Wyke's glancing header landed into his path. The result leaves fourth-placed Bradford six points ahead of seventh-placed Southend, but they had little to spare against hard-working Oxford. Conor McAleny, on loan from Everton, posed the most danger, forcing diving saves from Bradford keeper Colin Doyle as the visitors made a determined bid for an equaliser. But Simon Eastwood also had to be at his best to keep out second-half efforts from Wyke and did well to block a close-range header from defender Nathaniel Knight-Percival in the 15th minute.